Cream cheese takes this banana bread to a whole new level. The loaves have an almost pound cake like texture and taste. 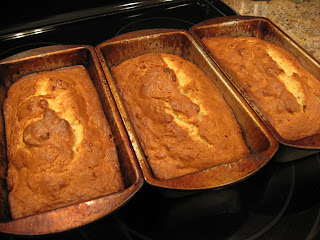 Instead of being brown-flecked like most banana breads, this one has a lighter color inside. Cream the butter and cream cheese together in a mixer bowl. 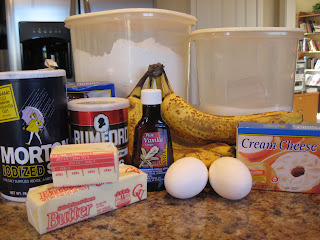 Mix in the sugar, then the eggs, bananas, and vanilla. In a separate bowl, combine the dry ingredients. Add them to the wet ingredients and mix until combined. Pour into 3 well-greased loaf pans. Bake at 350 degrees for 60-75 minutes. Start with less than the 3 Tbs. 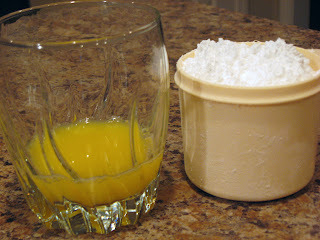 of orange juice, stirring it into the powdered sugar until you get a nice consistency. As you can see from the pictures, my glaze was a bit thin. I didn’t use the orange peel because I didn’t have any. It would add more flavor to the glaze to use it. These loaves freeze very well. Um if you weren’t my SITSta I’d have to flog you for the five pounds I gained reading this post!! I’m hosting a HouseParty for South Beach Diet this Saturday.. I’m doing Cuban themed food.. any suggestions o great one? I’m trying to “diet” here, and you’re not making it any easier! This looks DELICIOUS! I love banana bread but I don’t think I’ve ever made one with cream cheese before. Now I’m looking forward to it! Oh, I will have to try this! 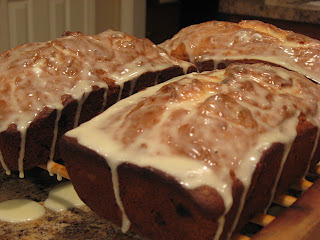 My family loves banana bread… and this looks so yummmy! This looks so delicious. I love baking with bananas. The glaze just brings this over the top! That looks so incredibly good! I am going to have to run out and get some cream cheese so I can try it. OOOOOOH yum! That would be perfect with cafe creme in the morning! Oh my goodness, who woulda thunk it! Creamcheese on banana bread. so yum! OMG…that looks so yummy… Thanks for telling me my blog was saucy, ididn’t know…lol. This one looks extra yummy!! !I’m in the same boat as Sherri. This looks so yummy! I will have to try and make some. I think me son would really love it. He loves the pound cake at Starbucks. 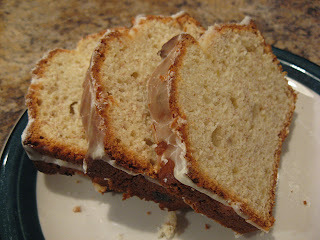 This recipe has to be one of the best banana breads I’ve tried! I made it this afternoon and had it waiting for the girls when they came home from school – they agree! YUM-O! my kids devoured this! have already made it a second time in 3 weeks! i cant wait to make this!!!!!! !mmmmm babeeee!!!! I made this last night and my family loved it! Do you think this recipe would work with zucchini, instead of bananas? Hmmm, possibly. If you try it, let me know how it turns out. What size loaf pans did you use??? I was going to try these in mini loaf pans to give as gifts but wasn’t sure how long to cook. I used regular sized pans (not sure exactly how big they are), but it should work great in mini pans. Test after 15 minutes, but it will probably take 20-25. I have made banana bread for years and loved my recipe…then I tried this one. No comparison, this is the most delicious and moist banana bread I have ever tasted. My family and friends loved it. Now I have it on hand for whenever folks stop by. It freezes well. Very, very good! I made the batter according to the recipe EXCEPT I substituted some S|tevia for some of the sugar. I glazed the loaves as directed then decorated the tops with pecan halves. High on my favorites list! It’s a sweet bonus when something delicious looks pretty (and has less sugar than usual)! !